Khulna (Bengali: খুলনা [kʰulna]) is the third-largest city of Bangladesh. It is the administrative seat of Khulna District and Khulna Division. As of the 2011 census, the city has a population of 663,342. Khulna is an old river port located on the Rupsha River. It is an important hub of Bangladeshi industry and hosts many national companies. It is served by Port of Mongla, the second largest seaport in the country. It is also one of the two principal naval command centres of the Bangladesh Navy. Navy base BNS Titumir is located in the city. A colonial steamboat service, including the fleet Tern, Osrich and Lepcha, continues to operate on the river route to the city. It is regarded as the gateway to the Sundarbans, the world's largest tidal forest and home of the Bengal tiger. Khulna is also situated north of the Historic Mosque City of Bagerhat, a UNESCO World Heritage Site. Khulna was part of the ancient kingdoms of Vanga or Samatata. In the 12th century, it came under the Sena dynasty during the reign of Ballal Sena and formed part of the Bagri division of Bengal. The previous name of this region was Jalalabad. During the 14th century, Shamsuddin Firoz Shah became the first Muslim ruler to arrive in the city. The Muslim settlements in the city increased during the time of Shamsuddin Ilyas Shah. Subsequently, many mosques and shrines began to be established. In the 15th century, a Muslim saint named Khan Jahan Ali acquired a jagir (fiefdom) comprising a large part of the greater Khulna Division from the king of Gauḍa. Later he started to exercise full rights of sovereignty and continued to do so till his death in 1459. After the death of Khan Jahan Ali, the city again became a part of the Sultanate of Bengal. During the reign of Daud Khan Karrani in the 16th century, Vikramaditya, one of the chief ministers of the ruler, obtained a grant in the southern Bengal including Khulna when the ruler was busy fighting the Mughals. He then established a sovereign kingdom, having the capital at Iswaripur currently in Jessore District. Vikramaditya was succeeded by his son Pratapaditya who gained preeminence over the Baro-Bhuyans, holding strong possession of Southern Bengal. He was eventually defeated by Man Singh I, a Hindu general of the Mughal emperor Akbar, in 1611 AD. Khulna remained under the rule of autonomous nawabs (rulers) of Bengal till 1793, when the British East India Company abolished Nizamat (local rule) and took control of the city. In 1842, the city became a part of Khulna subdivision of Jessore District. In 1882, it became the headquarters of Khulna District, comprising the then Khulna and Bagerhat subdivisions of Jessore district, Satkhira subdivision of 24 Parganas district and the Sundarbans. Khulna was declared as a Pouroshava / Municipal council in 1884 and promoted to a Municipal corporation in 1984 on the platinum jubilee of Khulna Pouroshava. In 1990 Khulna has been declared as a City Corporation. Khulna is the 3rd largest city after Dhaka and Chittagong. Khulna is located in south-western Bangladesh at 22°49′0″N 89°33′0″E, on the banks of the Rupsha and Bhairab river. It covers a total area of 59.57 km2, while the district itself is about 4394.46 km2. 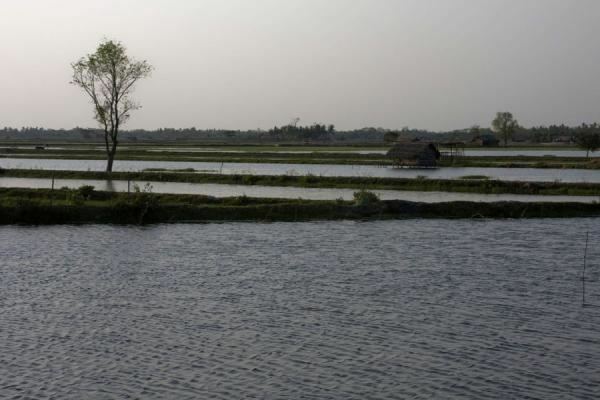 It lies south of Jessore and Narail, East of Satkhira, West of Bagerhat and North of the Bay of Bengal. 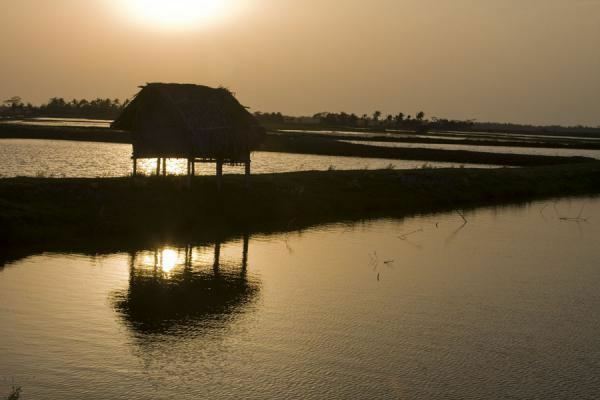 It is part of the largest delta in the world. In the southern part of the delta lies the Sundarban, the world's largest mangrove forest. The city of Khulna is in the northern part of the district, and is mainly an expansion of trade centres close to the Rupsha and Bhairab rivers. The Mayur River forms the western boundary of the metropolitan area. 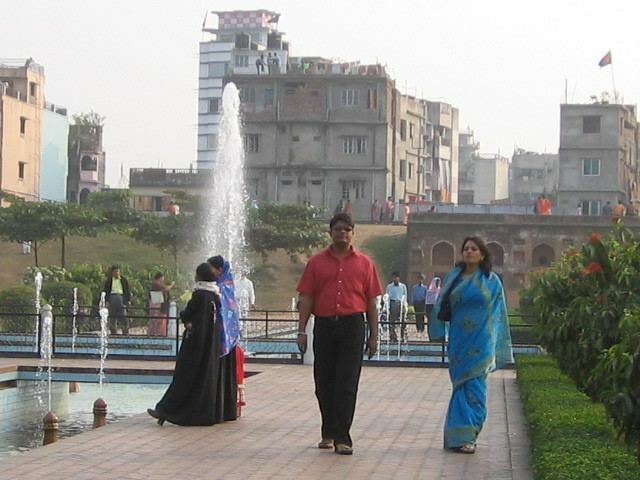 Khulna is humid during summer and pleasant in winter. Khulna has an annual average temperature of 26.3 °C (79.3 °F) and monthly means varying between 12.4 °C (54.3 °F) in January and 34.3 °C (93.7 °F) in May. Annual average rainfall of Khulna is 1,809.4 millimetres (71.24 in). Approximately 87% of the annual average rainfall occurs between May and October. Khulna Municipal Council was founded on 12 December 1884, and promoted to a "municipal corporation" in 1984. It has declared a "city corporation" in 1990. Khulna City Corporation is a self-governing corporation run by an elected Mayor, which runs the affairs of the city. There are 31 wards in the City Corporation area. Khulna Metropolitan Police (KMP) controls law and order as well as traffic movements within the metropolitan area. The area has been divided by eight police stations: Khulna Kotwali Thana, Sonadanga Thana, Khalishpur Thana, Daulatpur Thana, Khan Jahan Ali Thana, Aarongghata Thana, Horintana Thana and Labonchora Thana. The Metropolitan Magistrate Court (CMM) looks after the legal issues around the city. A governing body called Khulna Development Authority (KDA) plans the infrastructure development of the city and coordinates development-related work. There are two parliamentary constituencies within the city: Khulna-02 (Khulna Sadar Thana and Sonadanga Thana) and Khulna-03 (Khalishpur Thana, Daulatpur Thana and Khan Jahan Ali Thana). Khulna District and Khulna Division also have their administrative headquarters in the city. As of the 2011 census, the population of the city was 663,342. The city, in combination with localities forming the wider metropolitan area, is home to an estimated 1.44 million as of 2007. Density of population is about 19,000 per km2. The literacy rate among the urban people of Khulna is 59.1%, which is higher than the national average of 56.5%. Most of the people in Khulna are the Bengali people, as is the case in most of Bangladesh. The long-standing inhabitants of the city are known as Khulnaiya and they have a distinctive dialect called Khulnaiya. Apart from them, the city population is composed of people from the neighbouring districts and from the greater Barisal & Faridpur regions of Bangladesh. Many people from greater Noakhali region also resides in the city. Khulna also have a significant number of Bihari population. Most residents of Khulna speak Bengali, the national language. Many distinctive Bengali dialects and regional languages are also spoken. English is understood by a large segment of the population, especially for business purposes. There is a minority Urdu-speaking population, who are descendants of displaced Muslims from eastern India during 1947 and sought refuge in East Pakistan. Islam is the major religion in Khulna, approximately 80.12% people are Muslim, and the proportion of other religions are: Hindu 19.11%, Christian 0.67%, Buddhist 0.04%, and Others 0.06%. Khulna is the third largest economic centre in Bangladesh. 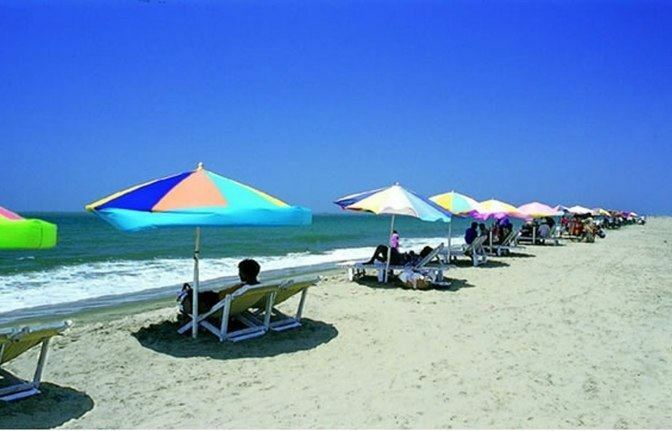 It is situated north of the Port of Mongla and has various heavy and light industries. The major sectors are jute, chemicals, fish and seafood packaging, food processing, sugar mills, power generation and shipbuilding. The region has an Export Processing Zone which has attracted substantial foreign investment. The city is home to the corporate branch offices of numerous national companies, including among others, M. M. Ispahani Limited, Beximco, James Finlay Bangladesh, Summit Power and the Abul Khair Group. Some of the largest companies based in the city include Khulna Shipyards, Bangladesh Oxygen, Platinum Jubilee Mills, Star Jute Mills and the Khulna Oxygen Company. Rickshaw is the most popular means of public transportation in Khulna. Usually people use it for short distance journeys. Baby Taxi and Tuktuk (Chinese auto-rickshaw) are also a common mode of transport within the city. There is a public bus service called Nagar Paribahan, which runs frequently between Rupsha to Phultala and have stoppages in all major localities of Khulna. Motorcycle is also popular among the middle-class people, while the rich people prefer a private car. The N7 national highway connects the city with most other parts of the country. There are several luxury and economy nationwide bus services available in Khulna. Most of them are private bus services. BRTC also operates Inter-district bus services from Khulna. Sonadanga Bus Terminal is the main bus terminal of Khulna. Major bus routes are: Khulna-Jessore-Dhaka, Khulna-Goplaganj-Dhaka, Khulna-Jessore-Kushtia, Khulna-Satkhira, Khulna-Bagerhat, Khulna-Mongla, Khulna-Narail, Khulna-Barisal, Khulna-Rajshahi, Khulna-Faridpur, Khulna-Kuakata, Khulna-Dhaka-Chittagong etc. Khulna Railway Station is the main railway station in the city. Bangladesh Railway operates 6 Express trains. Sundarban Express & Chitra Express run between Khulna-Dhaka, Kapotaksha Express & Sagardari Express run between Khulna-Rajshahi and Rupsa Express & Seemanta Express run between Khulna-Syedpur. Two Commuter Express runs between Khulna-Benapole. And mail trains between Khulna-Parbatipur, Khulna-Chapainawabganj and Khulna-Goalanda. The proposed route for Moitri Express 2 is from Kolkata to Khulna. Trial run for this train was ran on 8 April, 2017. Passenger service will be started soon. Jessore Airport, located 71 km north of Khulna city centre, is the only airport in the region. Biman Bangladesh Airlines, United Airways, US-Bangla Airlines and NovoAir have regular flights between Jessore and Dhaka. Those airlines have direct AC bus services from the airport to Khulna. Several passenger launches and cargo services are operated from BIWTA Launch Terminal, Khulna. There is a rocket service from Khulna-Dhaka, which is not running currently. Khulna has many prestigious educational institutions. Govt. Brajalal College is the oldest institution of higher education in the city, founded in 1902. Khulna University is the only public University in Bangladesh where student politics is strictly prohibited. Also, there is an engineering University Khulna University of Engineering & Technology (KUET) and a medical college Khulna Medical College (KMC). There are also some famous educational institutions like Azam Khan Govt. Commerce College, Khulna Govt. Women's College, Govt.M.M City College, Govt. Laboratory High School, Khulna Zila School, Govt. Coronation Girls School, St. Joseph School etc. Beside these there is 01 teachers' training college, 01 regional public administration training institute, 01 polytechnic institute, 01 vocational institute, 01 homoeopathic college and 01 social welfare training centre. Khulna is under the Jessore Education Board. This board varies the SSC and HSC standard. Besides these, there are 7 UCEP schools: 1 technical school and 6 IGV (Integrated General and Vocational) schools. 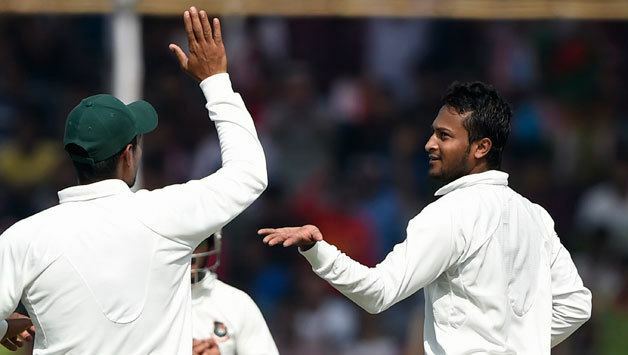 Cricket and football are the two most popular sports in Khulna. Khulna Division cricket team is a First class cricket team from Khulna Division and has its home ground in Khulna city. In domestic Twenty20 cricket, Khulna has a Bangladesh Premier League franchise known as Khulna Titans.But before it was Khulna Royal Bengals. In football, Khulna Abahani Club played in Bangladesh Football Premier League for several seasons before its relegation in 2008–09 season. Sheikh Abu Naser Stadium is the only international sports venue in Khulna. It hosts Test cricket, One Day International and Twenty20 International. It became the 7th Test cricket venue in the country on 21 November 2012. It also hosts several matches of the Bangladesh Premier League. On the other hand, Khulna District Stadium is the venue for other domestic sporting events. Besides many sporting events are organised in Khulna Circuit house stadium and in Khulna Zilla school play ground. Newspaper: The Daily Purbanchal, The Daily Janmabhumi, The Daily Probah, The Daily Tribune(English) etc. Sundarbans : In the south-western part of Bangladesh, in the district of greater Khulna, lies the Sundarbans (world's largest mangrove forest), the home of royal Bengal tiger. It is a virgin forest which until recently owed nothing to human endeavour and yet nature has laid it out with as much care as a planned pleasure ground. For miles and miles, the lofty treetops form an unbroken canopy, while nearer the ground, works of high and ebb-tide marked on the soil and tree trunks and the many varieties of the natural mangrove forest have much to offer to an inquisitive visitor. The Sundarbans is a UNESCO World Heritage Site. Rabindra Complex: Rabindra Complex is located in Dakkhindihi village, 19 km from Khulna city. 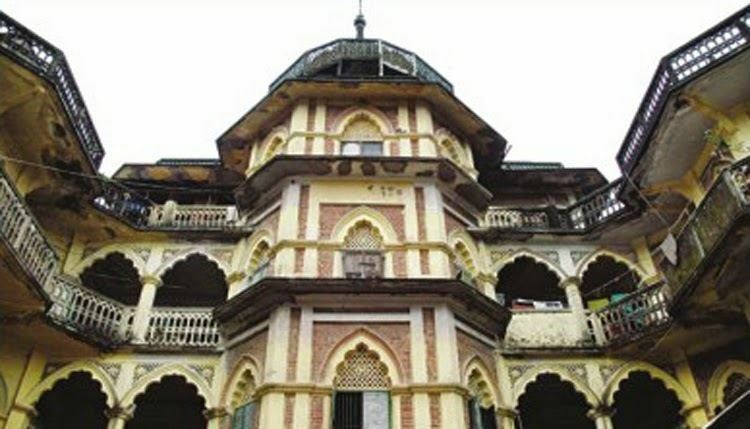 It was the residence of Rabindranath Tagore's father-in-law; Beni Madhab Roy Chowdhury. Tagore visited this place several times in his life. Recently it has been declared as a protected archaeological site by Department of Archaeology of Bangladesh.